They were the words we have all been waiting to say for over 5 years. WELCOME HOME GILAD SCHALIT! Baruch haba, it is good to have you home! Gilad was captured by Hamas terrorists on the 26th of June 2006 and returned to his country and his family on the 18th of October 2011. And what a momentous day it was! To say we ran the gamut of emotions as all of Israel gathered around TV sets and computers and radios (in my office – all at the same time! )is an understatement. Even the roads were extremely quiet – unusual for this time of year. Suffice to say it was an unproductive day for most Israeli businesses! Many wondered why Tuesday was not declared a public holiday but in a country that is used to getting back coffins in prisoner swaps, we were a bit more circumspect. We also with heavy hearts, remember and acknowledge the many victims of terror and their families as some of the perpetrators and accomplices were released. It is an extremely high price to pay and as much as the day was a great celebration it was also a day when we reflected on the victims of terror. Ordinary civilians killed simply for the crime of being Jewish. We hold their memories forever in our hearts. We are a nation that values life above all. We take pride in the fact that our army (IDF) and government have vowed to never leave a man behind. We hold fast to the Talmudic tenet that he who saves a life, it is as if he has saved the world entire. So yes, the stakes are extremely high but the value of Schalits life to us is the world entire. Many felt that until we saw Gilad with our own eyes, we would hold off on the celebrations.So you can only imagine the loud whoop of joy that resounded when we saw the first footage of him, albeit very thin and gaunt and in the hands of his captors. We now had proof that Gilad was alive. Tears rolled down the faces of my colleagues and I and then reality set in. he was not on Israeli soil yet. Okay, so lets calm down and wait until he is FINALLY free. To see him have to endure the repugnant interrogation that passed as an interview on Egyptian TV brought out anger and dismay. of course nobody was really surprised that Gilad’s hebrew answers were being translated into something completely different in Arabic. I walked away in utter disgust. 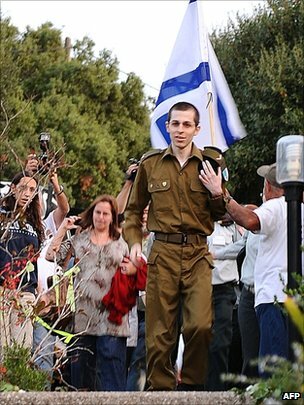 When we finally received word that Gilad was finally on Israeli soil and free, the celebrations began in earnest. Footage of Gilad, dressed in his IDF uniform, saluting Prime Minister Netanyahu and hugging IDF Chief of Staff, Benny Gantz were really touching but it was the reuniting of father and son that really opened the tear ducts!!! This was the moment we were all waiting for! Gilad has returned home. To his family and friends who never gave up the fight to bring him home. And to a jubilant country and ecstatic people. Gilad, we all love you and our collective wish is that you move forward in good health and healing. We have carried you and your family in our hearts and our prayers all these years. From South Africa to France and everywhere in between we have shouted our demands for your release. May your life be filled with joy. May you experience love. May you never know a day of darkness ever again. Gilad Schalit Chai. Am Yisrael Chai.